The heart of the story (besides of course the “Heart of the Ocean” which you can now buy) is a love story between star-crossed lovers. While Romeo and his Juliet were caught up in a familial squabble, Kate and Jack are doomed because of their difference in social class. Kate, the newly poor aristocrat who needs to marry to refinance her way of life, gives us entry into the upper class area of the ship. No doubt luxurious and comfortable, the people are snobby jerks. Kate is trapped and boxed in by the requirements of her social milieu and is only able to escape by touring the 3rd class areas with Jack. She flees her proper life and to go drinking, dancing, posing nakedly, and sexing it up with Jack. Message: Wealthy = Boring and Trapped. Poor = Fun and Free. To be fair, we get a slightly different view when we follow Jack and Rose as they attempt to escape the ship as it starts to sink. We see workers on the ship keeping the lower class behind locked gates not letting them climb to the top to escape in boats. At one point, the rich people are being sent out in largely underpopulated boats (tons of room to put up their feet and store their jewels). A few cries of “But we’re people!” and the story gets on to cover Jack and Rose’s flight around the ship and away from the evil jealous wealthy fiancé. Message: Wealthy = Boring and Trapped. Poor = Fun and Free. SPOILER ALERT… Jack dies and Rose lives. In this one way we do get a good idea of how social stratification played out on this ship. Indeed, we all know “women and children first!” Making it much more likely that Jack would die. In fact, 81% of the people who died were men. And although Rose only lives because she clasps to some floating wood and blows a whistle, chances are pretty darn good she would have lived anyway. Let’s look at what actually happened to the passengers on this ship of dreams. In total, there were 1,315 passengers and only 37% survived. While no one’s luck was good, for some it was not just luck but structure that interfered with their chances of survival. Of the 4 women who died from the 1st class, three did so because they chose to stay with their husbands. From the Titanic we learn about the social world. The social class you are born into, the social class in which berth you are placed, has implications for your life chances. If you are anything other than 1st class, those implications are dire indeed. 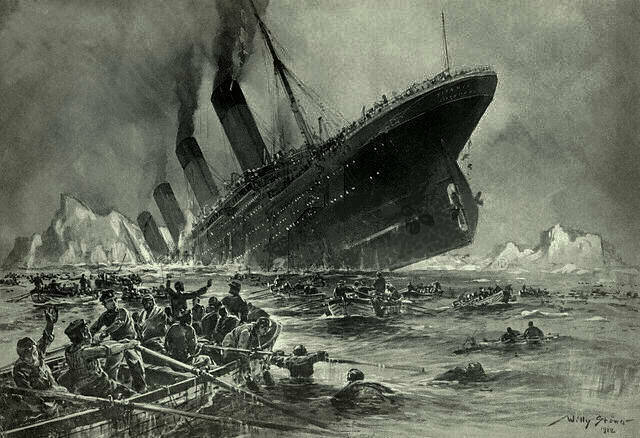 100 years ago who was allowed onto the life rafts largely determined who lived and who died. In turn, this was mostly based on your social class and thus it was your social class that determined your life chances. The story hasn’t much changed today. Access to health insurance, preventative health care, clean air and water, healthy food, and experience of stress (and much more) are determined by your social class. And the news has actually gotten worse. Since around 1980, the difference in life expectancy between the poorest and wealthiest has actually grown (read a summary of statistics and reasons here). Infant mortality rate is highest for low income individuals, but is even higher in middle class families when compared to the wealthiest (1st class) citizens. Indeed, the United States is ranked only 48th in the world in terms of infant mortality rates (meaning that 47 other nations including Norway, France, Taiwan, and Cuba have lower rates than we do). Rose may have found a whole new world of fun partying with the 3rd class, and I have no doubt that there are restrictions on how you can behave that are incredibly rigorous (not to mention more so for a woman living in 1910 – or being Molly Ringwald in 1980 – popularity is so hard), but the idea from the film that 3rd class equals freedom? I have my doubts. What are life chances? How are they determined by social class? How have your life chances been affected by your social class? A recent disaster in the United States was Hurricane Katrina. Watch this video about the victims of that disaster. How was the result of the hurricane similar to the sinking of the Titanic? How are the results different? What does that tell us about America today? Would you exchange social restrictions on your behavior if it meant that you had to live in poverty? Why or why not? Watch this TedTalk by Richard Wilkinson. How does the United States come out in global comparisons in terms of economic inequality? Why do you think this is the case? The numbers vary from source to source. You can examine the numbers I used here.